Cool character, awesome art - for just 1 buck! 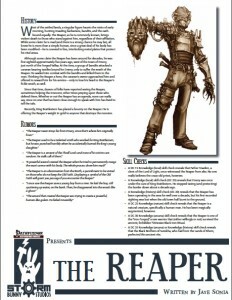 The Reaper is a man in interlocking metal plates who has been around for years – at least according to the history of this strange vigilante, though the rumors allow a DM to easily add one’s own spin on the mysterious killer that annihilates those that oppose him. The truth is rather strange and as such, 6 sample research ideas allow a DM easy ad verbatim investigation structuring around the characters.